Much of our craft as repair technicians comes back to problem solving, attention to detail, and guiding principles dictating a course of action. Everyday we encounter new situations, and with our overarching principles problems can be solved in the most logical, instrumentally restorative way possible. Attacking the root of the problem: We’ll use a saxophone as our example here. It’s all very well to stick a pad in a saxophone. Anyone with a credit card can buy a set of pads off the internet, get some glue and whack them into somebody’s horn. Some might even call that an overhaul; an ambiguous word to say the least. We have found that throwing new pads at an instrument rarely fixes the underlying problem. At Vanguard we explore the source of the issue. Are the toneholes level? Is the body bent? Are the keys rocking in their posts? How loose is that spring? Is the key cup perfectly flat? Only with years of experience and the right tools are we able to pinpoint the cause of an issue and address problems from the foundation up. Once all the structural work is perfect, that is when we can think about installing new pads. And even then, our years of knowledge are absolutely crucial in dictating the type of pad to use, the ideal resonators, the type of glue – even the perfect amount of glue. Our goal is to not only fix the problem, but to prolong the life of a pad. What happens when you throw a pad into a cup to cover a tonehole that isn’t level? At first, with a bit of squeezing, the pad will cover. But what happens after a few months when the impression in the leather begins to set? Your wonky tonehole starts to affect the coverage and all of a sudden you can’t play low Bb. Only with dedication and experience can a technician accurately and efficiently find and eradicate the source of the problem. This is one of the most important aspects of the work we do at Vanguard Orchestral. Seeing the bigger picture: This time let’s use a trumpet as an example: Recently your middle valve has started sticking. As humans, when we see a problem we sometimes fail to take in the full situation and we narrow our focus on the immediate issue. Many technicians would attempt to fix the valve by a process called lapping. This involves using a mildly abrasive paste which is applied to the valve and then worked up and down until any stickiness subsides. This process will probably fix your sticking issues, so what’s the problem? The problem is that lapping removes tiny amounts of metal from the inside the valve casing. Not ideal – especially on newer horns. In saying that sometimes lapping must be used as a last resort. If your trumpet has a build-up of caked-on spit and oil then lapping is sometimes the only solution to cut through the grime and get your valves functioning again. Back to our trumpet. Before jumping into lapping let’s inspect the horn. Is that a small dent in the 2nd slide? Maybe it took a wee knock which pushed it into the casing affecting the valve’s action. We have ways of ascertaining whether or not this is the case, and if it is we can simply reverse the damage. We can (so to speak) ‘knock’ it back the other way. Presto! Your valve works again. 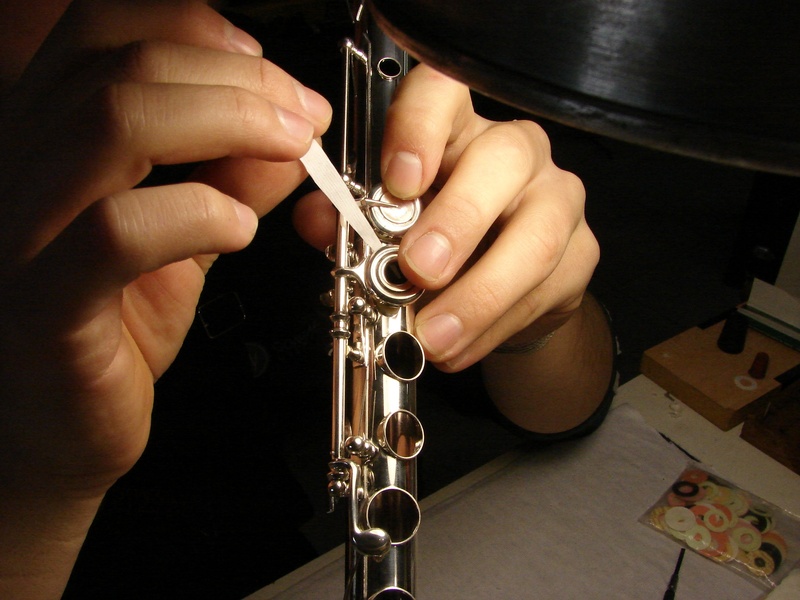 At Vanguard Orchestral we are always striving to improve our techniques, simplify our methods, leave as little traces of repair as possible, and think outside the box. Not opting for the ‘budget fix’: There is often a fine line here. Say a customer brings in a flute and we discover that it hasn’t been serviced in ten years and needs a complete overhaul, which will cost in labour, time and parts $800.00. The customer can’t afford that, and so they ask a question that can be difficult to answer: ‘Can you just do $200.00 worth of work to get it playing?’ Well, theoretically yes. We probably could do a half-assed job. But we certainly won’t be able to replace all the pads and fix all the underlying structural issues. In the end you will have a flute that plays reasonably, but there will still be many, many unsolved issues. We generally won’t agree to this sort of request. Letting an instrument go out of our workshop that we’re not happy with leaves us feeling a bit deflated. We pride ourselves on perfecting our craft and an incomplete job directly goes against the standard that we set for ourselves. With us you should expect the very finest, and complete work.